Genius Hour Introduction PowerPoint. 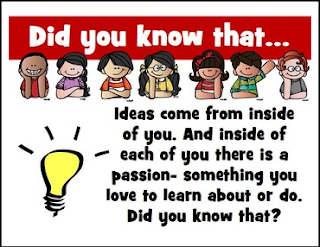 Genius Hour is a time set aside during the school day for students to research something they are passionate about. Genius Hour is sure to be a hit in your classroom. Included in this resource is a 15 slide introductory PowerPoint to Genius Hour. This slide show will help get your students fired up to start Genius Hour! Interactive strategies such as think-pair-share are used to get your students talking! To view slideshow, from the Main Menu choose “View” and then “Full Screen Mode”. -To exit slideshow, press the “Escape (ESC)” button. This resource is included in the Super Bundle. Click Here for Our Genius Hour Super Bundle! Go to your My Purchases page. Beside each purchase you'll see a Provide Feedback button, click it and you will be taken to a page where you can leave a quick rating and a short comment about the product. Why is feedback so important? Each time you provide feedback, you’ll earn TPT credits that can be applied to future purchases to save you money! Plus, the feedback you provide helps us make my products better suit your needs!